“This village is full of Taliban and I have no doubt that many bombs are planted at the road side”, the driver whispered slowly to his friend. We reached and entered his village in Sayed Abad and after turning we stopped in front of a house where we were invited by Nawid Sahil. We drove to a garden where many elderly villagers were already drinking and chatting. We sat on a carpet and leaned on pillows. For the whole way I had felt increasingly tension but I was comfortable at last. I told Martin that these villagers have the power and control, and we’re safe. 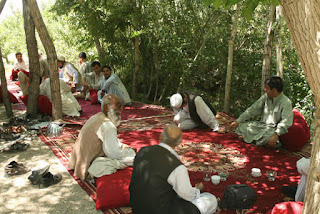 The villagers were talking about political issues and it seemed they were not very satisfied with the Karzai government. The glassman who seemed to be a family member of our host was asking us from time to time how we felt, “do we feel comfortable?” I assured him that we were fine and comfortable. We started to eat lunch very late; if it would have taken any longer we were close to start eating the leaves. The meals were delicious, the bread was local and tasty, and especially the yoghurt’s water was so yummy. The guys were telling us about the local beer. It was a bit strange that a few people drank beer while the elder villagers were there. I thought maybe they might not understand if it was bear rather than Pepsy or any other soft drink. The lunch was too much and we only ate a bit of it. 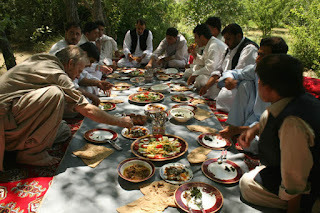 This is a part of Afghan traditions; they always cook more than there are expected guests. They presume other coming un-expected guests or sometimes are afraid of having a lesser meal. It is a bad reputation for the hosts if meals don’t satisfy the guests. Therefore they cook for 50 people when there are only 20 invited. I was a bit uncomfortable because of the security measures and the tight space where to walk around. You had to be careful when walking in garden, and there shouldn’t be women in sight otherwise you’ll be shot by the men. This is what they call honor and pride; this is a very sensitive part of the traditions, mostly among Pashton but among other ethnicities differences are there. 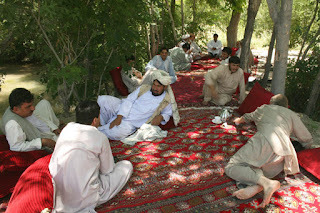 For example the Hazara woman works with her man side by side and appears with him together in public, same for Tajiks. On our way returning to Kabul, we changed the car, now obviously with a good driver who was careful of himself. The same fear I had felt in the morning I felt again in the afternoon. We again put Martin among us to hide him out of sight to not attract curiosity. When we crossed the Maidan Shar hill I was a bit relieved and thought that at least we were not in danger anymore. The Taliban's influence on the people is growing. Their access to the villagers too. A few weeks ago, Taliban entered into the Wardak district “Sayeed Abad” and asked the local governor to leave his job and support the Taliban. Local elders and the governor discussed, and after two weeks they told and promised the Taliban that if they conquer Ghazni province they will join and support them. 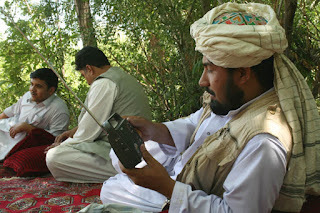 Taliban are entering villages and distribute their messages through Mullah’s and students studying in religious schools. They promise to support the villagers and to bring peace instead of horrors and fears. In their message they call the people to stand up against the US and its allies, they call for the people to stand up against the US forces who killed the civilians in southern provinces. Recently a video of beheading people who supported the US and the Karzai government was released by the Taliban. In the video some of the people were beheaded from their back neck while others kept their feet tight. One of the pictures shows Mullah Dadullah, the infamous and brutal Taliban leader who was killed a few months ago in the Uruzgan province by the international forces.